Located at 6987 Hamner Avenue, Pizza Nora offers hungry guests a comprehensive menu of Italian and American foods that have endeared the business to locals. Amidst chicken wings, Hawaiian pizzas and calzones, the eatery adds convenience to taste by letting guests order online for pick up orders. It does not get much easier than that. 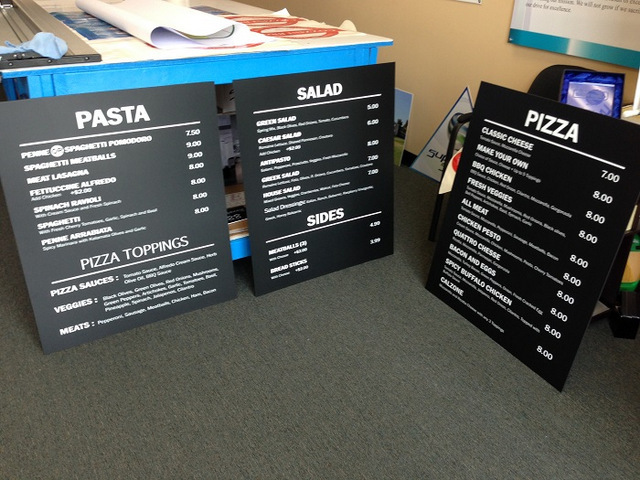 For those who like the idea of visiting the location, Pizza Nora needed menu boards. This is when Superior Signs and Graphics got the call for help. Appealing and easy to read! 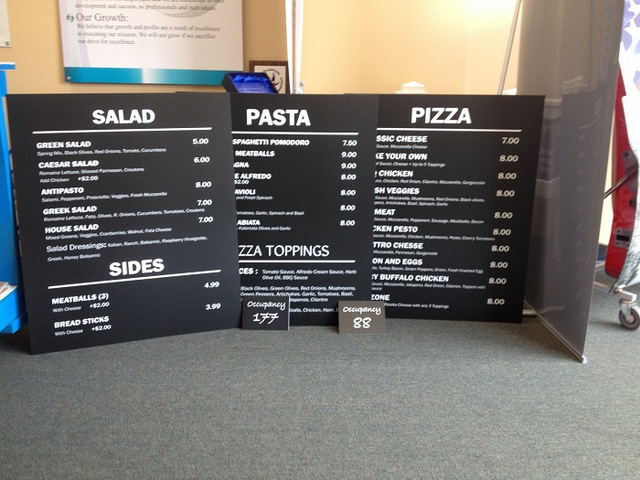 After consulting with the restaurant’s management team, we created menu boards that mimic the look of chalkboards. We used matte vinyl and a matte laminate that we mounted to 3mm black PVC. The boards attach to wood backers for an attractive display. Because of the black background and white print, the boards are easy to read, which is essential when the lines get a bit longer. Do Your Menu Boards Still Work for You? If you run a restaurant of any type and display menu boards, these signage products should bespeak your branding and enhance your eatery’s atmosphere. It is interesting to note that in some venues the atmosphere gradually changes. What starts as a semi-formal Italian sit-down restaurant quickly becomes a relaxed family-style dining place. Yet when your menu boards do not reflect this change, they may scare off some guests who are neither dressed nor in the mood for a semi-formal dining experience. Classic, just like their pizza! For this reason, we frequently work with restaurateurs who evaluate the settings in their establishments. When changes need to be made, the most visible ones on the interior are indeed these boards. They have the power to give the impression of a formal, relaxed, avant-garde and trendy eatery. This helps to attract the desired clientele, which in turn helps with your name recognition. 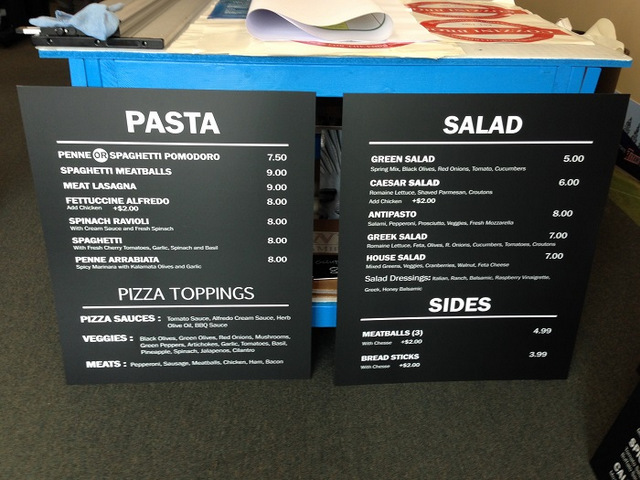 Chalkboard style menus for restaurants in Orange County are ideal for companies such as pizza parlors, bistros and breakfast restaurants. The black on white menu board with easy-to-change items is ideal for the fast food or on-the-go place that frequently changes the menu. Black backdrops with colorful print – frequently in fanciful fonts – work well for eateries that feature soups, salads and farm-fresh fare. Brand your dishes by including digitally imprinted images of the most popular ones on the sides of cabinet products. Adding the company’s colors to the mix further enhances the atmosphere of the locale. Those with an eye on beach cool may choose to display food choices on surfboard-shaped signs. The possibilities are truly endless. When you are ready to take another good look at the overall impression your menu boards make, call our seasoned graphic artists. We work with you to create your initial look or tweak the look that you may have chose a long time ago. We gladly help with the design or re-branding of your message. Material options and colors abound. After a site survey, we are confident that we can create the type of look that is going to help turn your eatery into a household name.